A few months ago I noticed a new traffic light and street sign had showed up in Midtown Milpitas, intersecting South Main Street just north of Montague Expressway. 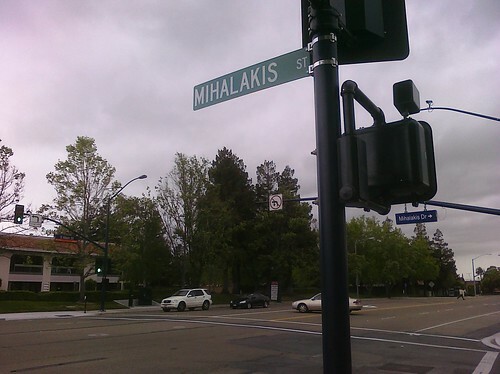 The sign read, “Mihalakis St.” I had no idea what it meant, but it was fun to say. I figured it was probably the name of the developer of the new Aspen Family apartments there, a little vanity eponym like so many other streets in the area. But then not long later, I happened to be flipping through my Arcadia Publishing Milpitas book and came across the name Mihalakis again. It was the most recent among a list of fallen soldiers from Milpitas, honored by the Veterans Memorial adjacent to City Hall. The city of Milpitas has a program wherein they name streets after its fallen veterans to honor their memories. (Interestingly the Milpitas seal bears the same image of Daniel Chester French’s The Minute Man statue as the National Guard logo, but in Milpitas’ case it’s a political allegory, not having to do with actual military service.) The soldiers so commemorated span conflicts from World War I to the present. The streets are located throughout the city but Mihalakis Street is the first memorial road to cross Main Street, part of what I call El Camino de San Jose. One block past Mihalakis at the upcoming Alexan Condos project another street is planned, Doonewey, named for Army Specialist Doonewey White. Doonewey, 26, a native of the Philippines who grew up in Milpitas, looked forward to returning home to his fiancée who was pregnant with their first child. He died of his injuries a day after a roadside bomb exploded in Baghdad on May 28, 2007Memorial Day. As it turns out there are several programs that use the nation’s roads and freeways to commemorate our veterans. One such program is the Blue Star Memorial Highways project, adopted by the National Garden Clubs in 1946. They place markers on highways, cemeteries, and V.A. hospitals as tribute to America’s armed forces. There are many Blue Star Memorial roads throughout California including State Route 58 in Santa Margarita, part of El Camino Real. Perhaps the most significant program is the Purple Heart Trail. It is a series of roads, highways, and bridges throughout the United States legislatively designated to honor recipients of the Purple Heart, a medal awarded to U.S. soldiers killed or wounded in action. Each segment has special signs featuring an image of the Purple Heart medal, a visual reminder of the freedom we enjoy in this country and the price our veterans paid to protect it. California’s Purple Heart Trail was just designated by the California Legislature in August, 2009. It is a 115-mile portion of U.S. 101 through San Luis Obispo County. In this part of the state, U.S. 101 either is itself El Camino Real or runs directly alongside it. Memorial Day is one day set aside for us to remember the soldiers who laid down their lives for us. A road however can be an everyday reminder, timeless, tireless, and lasting. El Camino Real bears the memories of our state, etched in asphalt. In these solemn dedicated stretches, this highway honors the memories of California’s sons and daughters who donned their country’s uniform and served heroically, many unto the ultimate sacrifice. Years ago when we were young and foolish my wife and I thought it would be fun to celebrate Cinco de Mayo with dinner at a Mexican restaurant, so we drove all they way up to Palo Alto to one of our favorites, Compadres Bar and Grill on El Camino Real. This, as it turned out, was a horrible idea. In honor of Cinco de Mayo, the restaurant decided to turn itself into a full-on Cancun-style party bar so they removed 80% of the dining tables to make room for wall-to-wall revelry complete with thumping music, plastic cups, sticky floors, and Corona girls. More bar, less grill. Not our scene. With most of the tables gone, we had to wait something like an hour and a half to be seated. Why didn’t we just leave? I have no idea; like I said, young and foolish. When we did get seated in one of the few tables cowering in the farthest corner of the place, the service was harried and the food was not their best. Who can blame them? The following year we were a lot smarter. We went to Compadres again…but on St. Patrick’s Day! We had the place to ourselves. And where did we celebrate Cinco de Mayo? At an Irish Pub in Sunnyvale! No waiting. Two cultural celebrations fully satisfied. Only in America! I’m sad to say Compadres is gone now, having abruptly shut their doors in 2008. Many a Stanford alum will raise their margarita glasses in memory of their sizzling fajita plates. If you want to take a chance and mark Cinco de Mayo with a fine Mexican meal, there are many places to choose from. If you see a Corona girl though, sal si puedes! 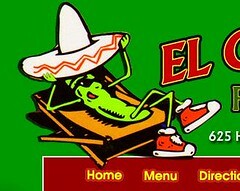 I could list for you all the Mexican restaurants on El Camino Real but that would be too obvious, so here’s a sampling of restaurants named El Camino Real, found all around the world. You can find a little piece of El Camino Real wherever you are. As long as you’re, you know, near one of these cities. ¡Viva! 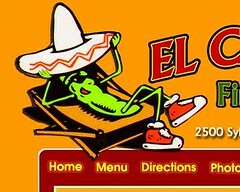 Voted #1 authentic Mexican restaurant in Toledo! I can guess who was the #1 inauthentic restaurant. I’m surprised there aren’t hundreds of these in California. Unusual menu serves Mex and Tex. BBQ and burritos! It’s shut down, but we won’t hold that against them. It was a great URL, though. Why didn’t I think of that? Okay so it’s not a “Real” CaminoHer Majesty might objectbut it gets honorable mention because hey! It’s in England! The 39th Annual Stanford Powwow is happening this weekend, Friday May 7 through Sunday May 9, 2010 (Mother’s Day!) in the Eucalyptus Grove at Stanford University, near the Stadium. I’m embarrassed to say I’ve never been, but I’m making plans finally to go this year. It’s billed as the largest student-run Powwow in the nation. The focus is Native American drumming and dance competitions, but I expect also to be dazzled by an array of arts, crafts, cultural displays, and food vendors. I’m really excited to try frybread. I don’t know what it will taste like but really with a name like that, you can’t go wrong. There are interesting intersections between Stanford University and local Native American history. Thousands of years before the Spanish arrived, the Muwekma Ohlone people occupied the entire Bay Area in an interwoven complex of tribal clusters. They left behind archeological remains and the vast Stanford land alone holds more than sixty excavated sites. Young Leland Stanford, Jr. used to enjoy collecting arrowheads and mortars and pestles from the property. In the 1930s the students adopted the Indian as the athletic teams’ mascot. In 1946 the “Mad Indian” logo was created, featuring an Indian caricature with a big nose. In 1952 Timm Williams (pictured), member of the Yurok Tribe (um…best tribe name ever), began appearing at sporting events as Prince Lightfoot in full Native regalia, and continued his appearances for nineteen years. In 1970 during the midst of the Indian occupation of Alcatraz, newly organized Native American students and staff petitioned University President Richard Lyman to put an end to the mascot appearances, feeling they were a mockery of Native American religion. Discussions, negotiations, and further petitions over the next few years led to the abolition of all uses of the Indian symbol and mascot, the reasoning being that they were at best insensitive and unworthy, and at worst offensive and racist. This issue continues to be controversial among alumni of the era who cherished the old mascot without meaning to give offense, and defended Williams’ sincerity. This blog is another reason I want to go to the Powwow this year. Obviously it promises to be a spectacular El Camino event. More than that though, I hope it will help me on the difficult path of reconciling nostalgia over a romantic notion of California’s mission days with the painful reality of the suffering and injustice the Spanish and later the Americans brought to the Native inhabitants. I can look at California today and easily see the Spanish, Mexican, and Yankee influences. This weekend I want to start opening my eyes to see the Native spirit, the sublime and the profane, that dwelled in this land before the others came, and to learn to recognize how it manifests today. This is the Powwow’s 39th year. This should also be the Stanford Spring Faire’s 40th year, but I can’t find any evidence that it’s happening this year or happened last year. For as long as I can remember the Powwow and Spring Faire have happened together, every year during Mother’s Day weekend. The Faire is an arts, crafts, and entertainment festival in White Plaza benefiting The Bridge, Stanford’s peer counseling service. I’ve been to the Faire many times, and every time I promise myself I’ll go to the Powwow next year. Well I’m finally going to the Powwow and go figure…no Faire. I haven’t confirmed if it’s on or off so if you know something about the Stanford Faire, tell me. 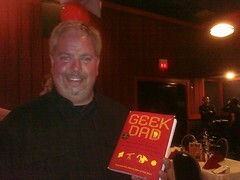 Saturday night my family was delighted to attend the private book release party for Geek Dad hosted by author Ken Denmead. The party was held at Dave & Busters at the Great Mall in Milpitas. Ken is a close longtime friend, and this book launch was the culmination of an exhilarating, transformative journey for him, a dream coming true. We relished sharing this special moment with him, and rejoiced in his excitement. It was a special treat for me because I was credited as a contributor to the book. Ken and I have known each other since the eighth grade, went to high school together, and have been good friends all along, more than two-thirds of our lives now. We got married around the same time to amazing wives and our kids are very close in age and are growing up together. (They might tell you they’re already grown.) He’s a professional engineer but he harbors many passions including movies, science fiction, internet trends, and fine food. Frankly, he’s a geek. “Geek” used to be an insult but today it’s been reclaimed and is a self-identifying term of pride used by those whose personalities, by Ken’s definition, achieve balance in the following traits: knowledgeability, obsessiveness, and social skills. In short geeks know a lot of stuff, throw themselves with abandon into that stuff, and enjoy sharing that stuff with like-minded friends. That’s Ken. 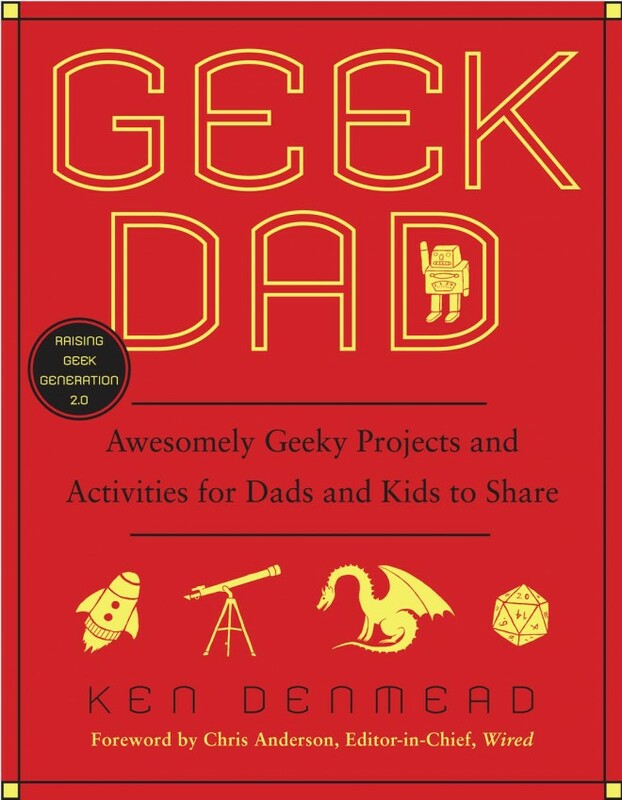 In 2007 the editor-in-chief of Wired Magazine, Chris Anderson, started a blog under Wired’s web site called GeekDad to celebrate the intersection of geekdom and parenthood. (Despite the name, Geek Moms are equally valued, if slightly underrepresented.) Geeks get married and have kids, and the blog is a forum for exploring ways for geeky parents to share their interests with their kids, benefiting all. 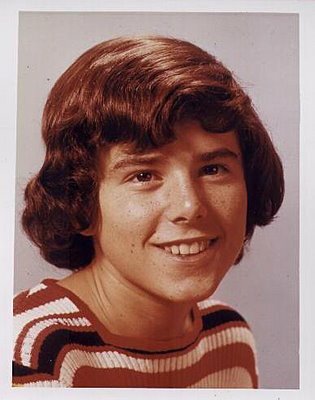 Ken joined the blog as a contributor and was shortly named its editor. Under his direction the blog and accompanying podcast have exploded in popularity with dozens of writers and millions of visits, being frequently referenced by major internet and traditional media outlets. In 2008 he was approached to propose and write a book which he did with amazing vigor. About one thousand gallons of sweat and two thousand gallons of Peet’s coffee later, his baby is done and its official release date is May 4, 2010, having been duly fêted on Saturday, May 1 by his supportive family, friends, and colleagues. Naturally there are El Camino Real connections here. 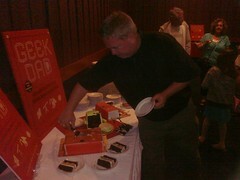 The book release party was at the Great Mall, which is on Main Street in Milpitas. This is part of what I call “El Camino de San Jose,” the historic road linking the San Jose Pueblo to Mission San Jose in Fremont. The Great Mall was built from the old Ford assembly plant. Further, one of the chapters in the book details a fourth-grade school project wherein his oldest son built an amazing model of Mission San Luis Rey de Francia made entirely out of cake and other edible ingredients. This model was inspired by the masterful cake creations of Charm City Cakes featured on the television program Ace of Cakes starring Geek Chef Duff Goldman. Mission San Luis is the largest in the California mission chain, founded in 1798 by Fr. Fermín Lasuén near present-day Oceanside in Southern California. 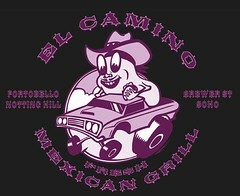 By Ken’s taxonomy I’m an El Camino Real nerd today, but I aspire to be an El Camino geek. 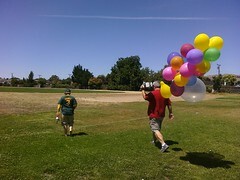 I have been to several El Camino community planning meetings, which are the closest things we have to conventions. El Camino Con? I asked Ken if with its tech-savvy focus this book could have been written anywhere else besides Silicon Valley. (He and his family live in Fremont which is a city that bridges Silicon Valley and the East Bay.) He believes it could have. The GeekDad blog has contributors scattered throughout the world, reflecting the fact that although so much technology innovation is centered here, content is king and is being created everywhere. I asked him how he felt at this moment and he replied, “scared and excited.” He’s always been a creative force and he has accomplished much with the blog, but having written and published a book is a milestone on a different level, a game- and potential life-changer. I’ve read a few chapters so far and I recommend this book whole-heartedly, and not just because it was an awesome party. I should also disclose that Ken graciously gave me a complimentary copy for contributing the flash cards project to the book. It’s an enjoyable read, infused with Ken’s signature dry wit and winking geek culture in-jokes. Mother’s Day is nearly here and Father’s Day and graduations are not far behind; the book is a great gift for all occasions. The projects it contains will be perfect for upcoming summer days, ways to forge family memories more lasting than video game high scores. My son, thumbing through it, exclaimed, “This is so cool. I love this book!” It will be available starting this week from a wide variety of online and real-life retail outlets. Ken deserves every success in this remarkable endeavor. It couldn’t have happened to a nicer Geek or a more beloved Dad. You are currently browsing the All Camino blog archives for May, 2010.